Most Prominent Manufacturer & Supplier of ASME B 16.11Socket Weld Cross Fittings, Forged Socket Weld Cross, MSS SP-43Socket Weld Equal Cross, Socket Weld Reducing Cross Fittings, Socket Weld Unequal Cross, SW Threaded Cross Pipe Fittings in Mumbai, India. Natural Steels is the leading producer and exporter of Socket Weld Cross throughout the globe. Socket weld cross fittings are a pipe attachment in which a pipe is inserted into a recessed area of a valve, fitting or flange. They are used primarily in the small pipe diameters for piping nominal diameter pipes. 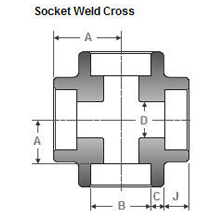 These Socket Weld Crosses provide benefits like high leakage integrity and great structural strength. Fillet welds and exceptional fitting geometry is adopted in manufacturing these SW Crosses in contrast to the Buttweld ones. We manufacture these Socket Weld Crosses in various sizes, grades with respect to various international standards like ASME, ANSI, DIN and so on and specifications owing to the requirements of our esteemed clients. One of them being ANSI B16.11 Forged Socket Weld Cross Fittings which exhibits exceptional mechanical properties and corrosion resistance. The types of Socket Weld Crosses produced by us are Socket Weld Equal Cross and Socket Weld Unequal / Reducing Cross and are used for lines conveying flammable, toxic or expensive material where no leakage can be permitted. A team of diligent workforce is assembled to carry out the manufacturing process of this socket weld cross. The available materials of our socket weld crosses are Stainless Steel Socket Weld Cross, Brass Socket Weld Cross, Cupro Nickel Socket Weld Cross and so on. We check the quality of our socket weld fittings by performing tests like Macro/Micro test, Material identification test, hardness test and inter granular corrosion test. We manufacture socket weld fittings using superior quality, unadulterated, unblended, crude raw materials to impart fine mechanical properties and finishing, lustre etc. Contact us now to avail your free quote! Natural Steels is one of the top manufacturers and suppliers of Socket Weld Fittings from India. Our prices for Socket Weld Cross are very reasonable. Please click on contact us now button or click here to send your requirement. Natural Steels maintains a high-inventory of Socket Weld Fittings and can export them at the best price for Socket Weld Cross. Natural Steels is a leading manufacturer, supplier, and exporter of Socket Weld Cross from India. We maintain a huge inventory of Socket Weld Fittings and you can buy Socket Weld Cross at the best price. Please click on Contact us now button or click here to send us your complete requirement to Buy Socket Weld Cross from Natural Steels. Exporting Socket Weld Cross to Singapore, Malaysia, Hongkong, Thailand, Indonesia, Taiwan. Other countries includes Afghanistan, Albania, Andorra, Austria, Bahrain, Bangladesh, Bhutan, Brunei, Belarus, Belgium, Bulgaria, Cambodia, China, Cyprus, Croatia, Czech Republic, Denmark, Estonia, Egypt, Finland, France, Germany, Greece, Georgia, Hungary, Iceland, Ireland, Italy, Iran, Iraq, Israel, Japan, Jordan, Kazakhstan, Kuwait, Kyrgyzstan, Lebanon, Latvia, Latin America, Liechtenstein, Lithuania, Luxembourg, Malta, Moldova, Monaco, Maldives, Mongolia, Myanmar (Burma), Nepal, North Korea, Netherlands, Norway, Oman, Poland, Portugal, Pakistan, Palestine, Philippines, Qatar, Russia, Romania, Russia, San Marino, Serbia and Montenegro, Slovakia, Slovenia, Spain, Sweden, Switzerland, Saudi Arabia, South Korea, South Africa, Sri Lanka, Syria, Tanzania, Tajikistan, Thailand, Turkey, Turkmenistan, Ukraine, United Kingdom, United Arab Emirates (UAE), Uzbekistan, Vietnam, Yemen.